It seems that with each new car you own, the number of indicator lights present on the dashboard grows exponentially. From the simple “check engine” light to “oil change” lights or “open door” indicators, knowing what each light means will allow you to separate the important from the non-important. These two indicators are often packaged together, and may be either in the form of a light present on the dashboard, or made into a “dinging” alarm, or both. The “ding” is used for three main indicators. The first of which is a unlocked seat belt, open door, or to notify the driver that the headlights are still on. The headlight indicator should only come on when the car has been turned off, or when the keys have been removed from the starter. Seat belt and headlight indicators can vary from manufacturer to manufacturer, but are generally denoted by a properly secured passenger, and beams of light coming from a light bulb, respectively. The check engine light is any driver's worst enemy. This light, many believe, accompanies only very expensive, or very dangerous problems with the engine of the car. This, however, is not always the case, and in fact, a number of less important, and less serious problems can trigger the check engine light. One of the most common reasons for a check engine light to appear is for a problem in the engine management system or emission controls. Keep in mind, though, that an improperly secured gas cap is interpreted by the car computer as a problem in gasoline tank pressure, a non-vital concern, and requires only that the car owner get out of the car and tighten the cap. If that does not solve the problem, you may need replace the gas cap as the seal around the base of the cap will degrade over time, resulting in an improper seal. If the problem does not go away, see a mechanic immediately. Any newer model car can be troubleshooted with the use of an “OBD code reader” which is plugged into the car, and shows the reported problem on the screen of the reader. Try to drive sparingly when this light is on and neither push the limits of the automobile nor request high performance from your automobile. The check engine light looks like a nearly square “box” which is often yellow in color. When this indicator turns on, it is rarely missed. Anti-lock breaks are nothing new on an automobile, but they are very important. Anti-lock brakes are those that do not permit the brakes to “lock” the wheel, or hug it so tightly that it does not spin. Locked wheels are very frequently found to be the cause of winter weather-related auto accidents, as the brakes lock the tires and the car finds itself failing to find traction, and then later slides into another car, person, or structure. The Anti-Lock Braking System indicator light looks like a circle with the letters “ABS” on the inside. If this indicator light turns on it is to indicate that the brakes are functioning, but the anti-lock system is not. This is a very important distinction. Overheated engines are a very serious concern, one that should be resolved as quickly as possible and without any heavy or long-term use of the automobile. Generally, overheated engines happen due to a failure to keep adequate levels of engine coolant. Low levels of engine coolant means the same, hot coolant circulates continuously without having enough time to cool itself. Thus, the coolant quickly rises to the same temperature of the engine and works only to maintain, not cool, the current temperature. Engines that cannot disperse heat are prone to cracking, a problem that often requires a complete engine rebuild or replacement. The engine overheating indicator is usually red and displayed as a thermometer suspended over fluid. When this light comes on, stop driving immediately. Do NOT immediately check coolant fluids, as they are likely hot, and significant pressure is sure to be found under the cap. Many drivers have sustained horrible burns from overheated coolant. Instead, allow the car to cool for thirty minutes or more before reaching for the coolant cap. The low oil pressure light indicates to the driver that there is most likely not enough oil in the engine. Failure to keep appropriate levels of engine oil ultimately results in wear and tear of the engine, a very serious concern. The low oil pressure light appears as an oil can, and often features a small drop of oil coming off the tip of the spout. When this light appears, check oil levels, and add oil as appropriate. There are a number of reasons why a battery indicator light may appear on the dashboard. This light does not, in any way, mean that you need to replace the current battery. Generally, the battery light indicator lights up to make the driver aware that the battery is not being adequately charged, or is not capable of holding an adequate charge. In older cars, where corrosion has slowly developed on the terminals and wires, the terminals may need a quick cleaning that allows for a better connection and the proper flow of electricity from the car to the battery and battery to car. This light may also indicate that the alternator need replacing. The battery, then, may require a “jump” after replacement, as it may not have been adequately charged. Finally, batteries that are more than 3-4 years old may require absolute replacement. Always check first to see if it is not a problem of dirty terminals. The battery indicator light looks just like a car battery and features two poles and a “+” and “-” that are meant to showcase the positive and negative terminals. The brake light is meant to indicate the usage of the parking brake, or problems in the general braking system. The light should come on any time that the parking brake (also known as the emergency brake) is engaged to stop drivers from pressing the gas and putting unnecessary wear on the brake. If the car is in motion, and the parking brake is not engaged, there may be one of many problems in the braking system, none of which are to be taken lightly. See a mechanic immediately. The parking brake indicator light is circular, routinely featuring an exclamation mark meant to catch the attention of an unsuspecting driver whose parking brake is engaged. You probably won't need an indicator to know that there are problems with the power steering. 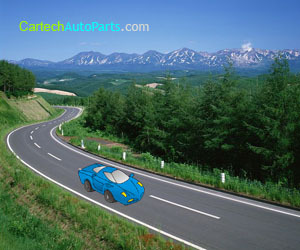 In modern automobiles, the turn of a steering wheel is assisted by power steering to turn the car. Without power steering, the driver will need to manually turn the car, which requires a great deal of strength as there is little assistance. This light may come on when there is not enough power steering fluid or when the power steering is not working properly. While not a very serious concern to the automobile, drivers without power steering cannot quickly respond to changes in traffic and will be slower to change position or avoid immediate dangers. Also, younger or older drivers without a lot of strength may have problems turning the automobile.